This is a draft, still needs to be edited, but you might find it interesting or entertaining. Every word in this story is true. Like many families of the mobile phone age, we often communicate through texts. Most are of the “can u pic me up at train 9:30” variety. This text though, coming from my daughter who was then a junior in college, snapped me out of a form of amnesia. I hadn’t talked or thought about this in years. In 1976 my father, Paul Spector, was slated to testify for the prosecution in the trial of Mafia chieftain Phil (Rusty) Rastelli. As the trial date neared, prosecutors and the FBI expressed concern that Rastelli might try to stop the testimony, either by killing him or threatening his wife and kids. So one night, federal agents changed our name to Calasanto and flew our family to DC, where we were to sit out the trial in safety prior to the start of our new lives. I was a bit of a wiseass back then and most of my memories about the next few days are what a wiseass kid might notice. First, gun toting federal agents drove us to a motel-filled strip of road where we pulled into the only facility with a “no vacancies” sign. No vacancies and no cars in the parking lot, just a big RV. The next day, they brought us to a government office to be briefed on our new identities. As we followed the agents through the maze of cubicles, I noticed a flyer in a mail slot labeled Calasanto. “Look, we have mail,” I said. “Don’t be funny,” my mother scolded. My father was at a meeting and the rest of us ate in the motel restaurant. When it came time to sign for the meal, my mother couldn’t remember her new name. I reminded her and she said, “How do you spell it?” The waitress smiled. Stories like these beg for beers and details. 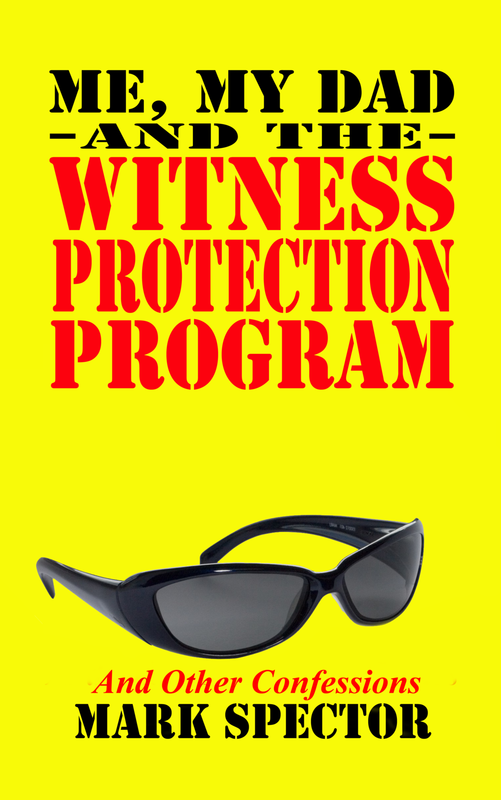 “I was in the witness protection program” is an amazing icebreaker. Yet I rarely spoke about it. As the years went on, I held back because I met people with their own Mafia stories to tell. Except for the trip to DC, my experience seemed pretty mundane. And did I really want to share stories with the former kneecap-busting enforcer who went on to join the information technology department of a major bank? What if he worked for Rastelli? “Not so loud,” she replied. She leaned as far away from me as the seat would allow. She did not want to be in the line of sight of other movie theater patrons who turned to see who was talking. Knowing mobsters who became historic figures and movie characters seemed pretty cool. For about a day. I told my children, but they were but they were at that age when kids are more astonished that their father can parallel park a minivan. The creepiness of it all quickly came back to me, and I put it back in the back of my mind. The years went on and the less I spoke about it, the more I forgot. I might pass a remark to a guy at a party or a clerk in a store. In those situations I could get a few chuckles or a wide-eyed “Really? !” and then never see the person again. But around people I knew, not a word. It wasn’t a secret, just a long-forgotten, strange and somewhat embarrassing chapter in my life. Something to be left behind, like the haircut in my high school yearbook photo. I never realized how little I wanted to remember it until an office mate insisted on showing me a YouTube video of the Funny Guy scene in Goodfellas. Watching Joe Pesci twist an innocent chuckle and compliment into a life-threatening insult, I experienced the sensation of an ice pick piercing my intestines, twisting and digging its way to my inner being. “Isn’t this great,” my colleague cheered. “Why not?” he called as I shook my head. I think that’s when the amnesia hit. I couldn’t bring myself to talk about Rastelli or any of the other mobsters I’d met. Until I got that text from my daughter. For the record, my father took the stand as a victim. He owned a small fleet of lunch wagons and a commissary to supply them. He could run his business unmolested as long as he paid his dues to the Workmen’s Mobile Lunch Association. Rastelli, the reputed head of the Bonanno crime family, may have dealt in drugs, loansharking and murder, but the association gave the government a paper trail of extortion and anti-trust. I shared that information with my daughter in an email. I also offered to tell the whole story that Friday night, when she came home for the weekend. I probably wouldn’t have made that offer had I known it would trigger so many distant and strange memories, including the answer to the hardest question of all: What possessed your father to come forward and testify? He didn’t exactly come forward. Rastelli’s 1975 indictment, a year before the trial, was the culmination of a 2-1/2 year investigation that climaxed in simultaneous FBI raids on the association’s office and the member commissaries. When they brought my father in for questioning, one of the first agents he met said, “Remember me? I sat next to you on the plane to Buffalo.” My father was on that plane to bet on a fixed horse race. Raised by a struggling immigrant family during the Great Depression, my father started cutting school as soon as he was old enough to sweep floors, help milkmen with their deliveries—anything to bring a dollar or two home to his mother. By the time he was in the eighth grade, he’d dropped out of school. He grew up to build his business on street smarts and hustle. And when the Mafia runs the streets, you work and play by their rules. My father understood those rules. Like many Workmen’s Mobile Lunch Association members who took the stand, he was happy to pay his dues. Before the mob came in, individual lunch wagon operators didn’t compete on price or service. They crowbarred windshields, slashed tires—anything to get a competitor’s truck off the road long enough to miss a lunch break, where they could show up and sell food in the driver’s stead. My father may or may not have liked Rastelli—the memory’s not clear—but he certainly knew how to get along with him and I’m sure that he respected him. If Paul Spector were alive today, he’d say that payday lenders and Wall Street traders are worse than the mob. Because they’re legal. But the law is the law and I saw firsthand how little that mattered on the mob-run streets of New York. At the same age that my father dropped out of school, I started spending after-school hours at his Brooklyn commissary. I learned that bribing a health inspector was as much a part of business as cash flow and payables. If you run a new car to the ground, toting cases of soda and other supplies it was never designed to carry, you torch the car for the insurance money and buy another. Speaking of torching, there was a plot to blow up a competitor’s truck that thankfully never materialized. That was outside the storefront my father used as a commissary. There was another storefront in Greenpoint, Brooklyn whose glass windows were made opaque by a thick, swirly layer of soap film. I remember staying in the car while my father went into that store to pay his “dues” and talk to Rusty. My father enjoyed betting the trotters and like the high-speed traders of today, he sought every edge he could get. He bought a harness horse and gained access to the stables and paddocks where horses and drivers prepare for races. He’d try to scope out which horses were in the best shape and what fixes might be in the works. I wasn’t on that plane to Buffalo, but I traveled with him to racetracks from Maine to Maryland, betting all kinds of tips on fixed races. Sometimes I went in his stead. The fixes didn’t always work out as planned, but neither do all of a Wall Street trader’s bets. Telling this to my daughter reminded me that I was no innocent bystander to all this. Out of nowhere, I unexpectedly recalled and revealed how my encounters with underworld figures led to my first part-time job, not working for my father. At an age when my friends bagged groceries or scooped ice cream for cash, I became my high school go-to for illegal football gambling. I would come to school with betting slips and hand them out in the cafeteria. Each sheet had point spreads for college and NFL games. At the bottom of each slip, there was a coupon with spaces for your name and your picks. If you picked four teams and they all covered the spread, you made 10-1. As you picked more teams, the odds went up. Ten for ten paid 200-1. The bookie I worked for gave me 30% off the top of the gross bets, and he was responsible to pay the winners. I never had enough sheets to go around. On my lunch period, I would go to the school library, drop nickels into the photocopy machine and make duplicates. When I showed up in the cafeteria, kids would jump from their seats, surround and reach out for me like I was a sports hero. Every high school kid wants to be popular, but for me there was an extra dimension to this thrill. I was a full-fledged twerp. A few years earlier, these same kids bullied me, surrounding me to either smack me around up or watch me get smacked around. With my gambling operation, I became one of the more popular 16-year-olds in my neighborhood. One week I asked the school librarian for change for a dollar so I could make those photocopies. He smiled snidely and said, “Sorry, don’t have any.” At that point, I began to suspect that the school was on to me. Not long after that, the school took an anonymous student survey to gauge the extent of drugs and other illegal activities. The administration opted me out of taking the survey, making me wait it out in the vice principal’s office. Afterwards, a friend told me there was a question on the survey about football betting slips. Now, I knew they that the administration knew what I was doing. Yet I never got busted. Never got called in and confronted. Never got handed over to the police. At the time, I thought they looked the other way. Today, I’m not so sure. Newspaper accounts of Rastelli’s indictment and conviction suggest that I was running this racket just as the police and FBI were getting him in their sights. My link to the bookie was just one degree of separation from Rastelli. Today I can see how busting my little $30 gambling operation could have exposed the investigation. If you were the FBI, would you blow that shot at the “godfather” to get the small time bookie I was dealing with? Today, I’m guessing that the feds just put him on the back burner. Sure enough, shortly after Rastelli’s conviction, they busted the bookie for a phony check scheme. Today, when you turn 18, your friends buy you a lottery ticket. Among the gamblers my father and I knew, turning 18 meant you were old enough to drive to a racetrack and bet. I became their mule, driving to far off racetracks with a few hundred dollars cash in my pocket, sometimes driving back with a few thousand. These trips were to small rural racetracks, where races could be fixed under the radar of state gambling commissions. Betting pools very small. Even a $200 bet could throw the odds out of whack, especially when owners, trainers and other crooked players were betting the same fix. I’d bet $10 when the windows opened and spread my betting out over the course of the next 15 – 20 minutes until the race began. For my work, I got money for gas and tolls, plus ten or twenty dollars to buy my own tickets. I was in college and had to work these trips into my class schedule. I might leave school at 1 or 2 p.m. for a 5- or 6-hour trip to the rural racetracks, bet the horse, collect the winnings (or not), and drive home. On one long drive, I spent the whole trip thinking about a paper that was due: Contrast the teleological and ontological arguments for the existence of God. I’ll give you 100-1 that I was the only kid in that class who drafted his paper on a racetrack program. I think I got a B. No cell phones. I couldn’t call my father and ask if he wanted me to bet for him. (That’s also probably one of the reasons the gamblers trusted me to make the bets; I wasn’t going to be betting enough to throw the odds out of whack.) I could make an extra $100 - $200 going to the windows for these guys, at a time when a Big Mac, fries and a shake cost about a dollar. In another incident that I vaguely remember, I was sitting around a kitchen table with a hoodlum and a guy in a suit. The suit gave the hoodlum some papers, which he signed. The suit checked the papers and gave them to me to sign. With that act, I became the owner of a second mortgage on the hoodlum’s house. I don’t remember the numbers but I remember thinking as I signed those papers that this second mortgage was worthless. I was close enough with the hoodlum to know that he was behind on his first mortgage and had no legitimate source of income. Judging from the rumor mill, there was no illegitimate source of income either. I owned a second lien on a house destined for foreclosure. While I processed that thought, the suit gave me a second set of papers to sign. With those, I “sold” my lien on the property to someone else. The whole thing took about ten minutes. When it was over, the hoodlum’s debt to a loan shark was paid. My signature on the papers gave the transaction a clean front, a name with no criminal record to turn up in a background check. The suit promised me that I would never hear about that transaction again and I didn’t. Not until the financial crisis of 2008 did I understand what happened. The worthless second mortgage was sold into a pool with other loans, never to perform, never to recover the original investment. As I said earlier, if my father were alive today, he’d say that payday lenders and Wall Street traders are worse than the mob. The loan shark in this story was charging a then-illegal 80% interest. I’ve seen business plans with Internet lenders where they base their returns on APRS in excess of 400%. More important, every one of us sitting around that table, plus the people in the background that engineered it, we knew we were breaking the law. We could go to jail for what we were doing. Yet nobody went to jail when the same scam on a massive scale brought the global financial system to the brink. But the law is the law and you don’t want to be doing any of this when your father’s under surveillance and the feds need his testimony. The most dangerous risk I took was the same one countless college students took in the mid-1970s. I might ask friends to chip in with me for an ounce of pot that we’d later split up. Though I made no profit, the split technically made me a drug dealer. At that time, New York had some of the toughest drug dealing penalties in the country. I don’t know what that traveling companion to Buffalo said next, but in the back of my mind I wonder if the FBI gave my father no choice but to testify. Rastelli wasn’t the only player in this drama who could threaten him and his family. All these sudden reminiscences stunned my daughter almost as much as they stunned me. My wife, bless her, put it in perspective for both of us. “Look at your father now,” she said. Yes, my name is really Mark Spector. My family never relocated. At that time, only my father understood Rastelli’s power and my mother told him, “If you want to go, go without us.” The FBI couldn’t legally force us into hiding. We flew back to New York and took our chances. My father spent three days on the stand. A little more than a year later he died from a sudden heart attack brought on by diabetic complications. At Jewish funerals, we keep the casket closed. Word got back to my mother that mobsters got into the funeral home and looked in the casket. They wanted to make sure the death wasn’t staged. I dropped out of college and joined a cousin running my father’s business, but we couldn’t make a go of it. Factories in New York were shuttering and the lunch wagon business started to contract. We closed the store, kept one truck, and bought our supplies from a commissary run by a Rastelli protégé. They could sell us sandwiches for about what it cost our commissary to make them, sodas for almost as little as we had paid the bottlers directly. The commissary’s main source of profit was money laundering. During the ensuing summer, I started my mornings sitting on milk crates and folding chairs in the commissary parking lot, drinking coffee and shooting the breeze with Rastelli associates. It didn’t take me long to realize that a wiseass has no business with wise guys. My Funny Guy moment almost came when a fatso sitting next to a hit man insisted, with all the tenderness he could muster, that he could make a lesbian straight. My stoic nod belied a deep, inner struggle to keep a straight face. That fall, I left the business and went on to an honest job—a wife, three kids, a mortgage—and a teetotaler’s taste for mob movies and gambling. Since revealing all this to my daughter (and through her, my other adult children), I wondered how my father allowed me to get mixed up in this. I asked my mother, but she’s well into her 80s and these aren’t exactly pleasant memories. It’s not what she wants to be thinking about at this stage of her life, and it’s not so important to me that I would expect her to. Best I can tell, my involvement started when I was in the eighth grade and I told my parents I wanted to take a part-time job delivering advertising circulars after school. That was the same age my father was when he dropped out. Concerned that once I started to make money, I might follow in his footsteps, my father thought he’d keep an eye on me. He wanted me to go to college. He wanted be to “be somebody.” So rather than let me take that job, he told me to work for him. He basically paid to me to stay in school and I didn’t mind. His commissary gave me a safe after-school alternative to playground where I was bullied. Once I got to my father’s store, I was there. Seeing and hearing things kids my age and the neighborhood where I grew generally didn’t see or hear. As time when on and my father’s diabetes became more debilitating, he needed help. My father seemed to think (and foolish me, so did I) that I could do my schoolwork amid the chatter of his commissary kitchen. That I could study for exams in a lunch wagon while waiting for a whistle to blow. That I could skip a night of sleep to drive to New Hampshire and bet on a horse for him and his associates. While I was trying to understand my parents, my children were on Wikipedia, finding out more about Rastelli and his gang than I ever cared to know. I went to the same articles and they brought focus and understanding to the many memories that I share in this piece. For a little while, I considered going to the district court archives to see if they still had a transcript of the trial. On a historic level, my father’s testimony and the trial played a key role in the New York mafia’s undoing. It put Rastelli behind bars, weakening his oversight of the gang. In the ensuing vacuum, FBI Agent Joe Pistone was able to infiltrate the mob under the Donny Brasco alias. Pistone spent six years undercover and his testimony led to more than 200 convictions. On a personal level, though, there’s much more that I should want to know. Most association members took the stand just long enough to testify that they paid their dues and received nothing in return, except that their business was protected. What did my father talk about for three days? Why did prosecutors tell him that his testimony counted for 35% of the conviction? What about his testimony prompted a Rastelli co-conspirator to tell an informant that he held no grudge, saying “Spector told it like it was”? And of course, what did my dad speak about when I waited outside while he talked to Dominick or Rusty? The more I think about it, the less I care. These questions wouldn’t exist if the Federal Witness Protection Program hadn’t found its way into pop culture, had the simple mention of that phrase not drawn so many wide-eyed “reallys! ?” The mobsters, the testimony, my own petty violations of federal anti-racketeering laws, this all this would have been forgotten along with the name of Professor —. After my father passed away and I was running the commissary, policemen would come by to buy sandwiches or drinks and tell me how much they liked him. Then when we closed the store and I hung out on those milk crates, lower echelon Rastelli associates also told me how much they liked my father. My father got along with everyone. Whether they were the mobsters who policed his industry or the cops who policed the neighborhoods where he did business. I don’t need to know any more than that. I don’t need to face any more reminders of things that I may have seen and done. Better that I leave this chapter of my past behind me. Way behind me. “My life is spectacularly boring,” I replied.